The word Inflammation is derived from Latin; inflammare (to set on fire), and Inflammation is a major contributor, if not the primary cause of all disease. Inflammation is the immune systems response to protect itself against harmful stimuli-like damaged cells, irritants or pathogens, and can be acute and short lived, chronic, low grade or systemic. Inflammation is also the way the body begins the healing response, and can have both harmful and beneficial effects. Inflammation can be beneficial in the acute phase. Acute inflammation prevents the spread of infection and damage to nearby tissues, helps to remove damaged tissue and pathogens and assists the body’s repair responses. For example, you sprain your ankle. The ankle becomes warm, red and swellon and there is pain causing you too want to immobilize it. These symptoms usually don’t last too long and the body, with its infinite wisdom, has known what to do since the beginning of time to heal itself. It has 50 billion cells that work together in a beautiful symphony to engulf damaged cells and increase blood flow and oxygen to the injured area. Unfortunately, sometimes the system goes awry, and the result is chronic inflammation. 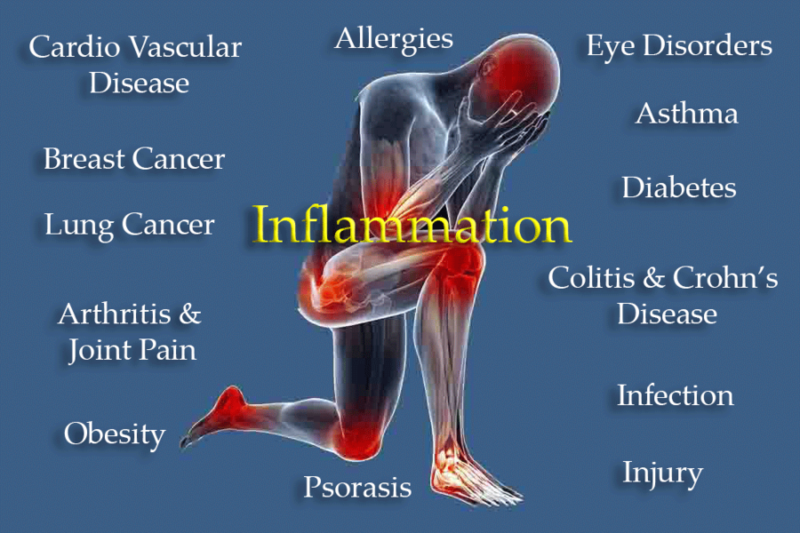 Chronic inflammation is detrimental. It can lasts months to years and cause pain, stiffness, fatigue, increased blood sugar, increased blood pressure, ulcers, “brain fog”, Irritable Bowel Syndrome, skin issues (e.g. eczema) to name a few possible symptoms. Chronic inflammation is insidious. It can cause destruction of tissue, scarring (fibrosis), and death of cells (necrosis). Genetics play a small part, as well as lifestyle choices, but the bulk of inflammatory causes is thought to be due to infectious (bacterial, viral, fungal, parasitic) and environmental toxin exposure. The idea that infection can cause chronic disease is not new and gained popularity in 1981 when an Australian physician, Dr. Barry Marshall, discovered that h. pylori bacteria could cause peptic ulcer disease as well as stomach cancer. It took 10 years for antibiotics to become the standard of care to treat h. pylori and 25 years for Dr. Marshall to win the Nobel prize in medicine for his groundbreaking work. We now know that HPV (virus) causes cervical cancer, HIV can cause Kaposi’s Sarcoma (cancer), researchers at Yale have linked chronic Lyme disease to Alzheimer’, MS (Multiple Sclerosis) has been linked to a bacteria called c. pneumonaie by researchers at Vanderbilt University (Charles Stratton, Ph.D) and c.pneumonaie has been linked as well to asthma. So, it leads one to wonder what diseases are affected by inflammation? The short answer is ALL of them. Whether it’s MS, Lyme, Parkinson’s, Stroke, ALS, Autism, Alzheimer’s, or other neurological diseases-the common denominator is brain and spinal cord inflammation. If it’s Rheumatoid arthritis, Lupus, Fibromyalgia, Sjogren’s, Chronic Fatigue Syndrome, Diabetes, etc. The joints, muscles and tissues or organs are inflamed. If it’s IBS, Crohn’s Disease, Ulcerative Colitis, GERD, SIBO, diverticulitis, or Hepatitis it’s the GI system that is inflamed, asthma and allergies it’s the pulmonary system. If it’s hypertension or myocardial infarction or ischemia (high blood pressure, heart attack, angina) it’s the cardiovascular system, and so it goes for the laundry list of other chronic medical conditions. How do we know if we are inflamed? In 2004, Time Magazine called inflammation “The Secret Killer.” Every day we all make choices that are either pro-inflammation (smoking, poor diet-too much sugar, alcohol, processed food), not enough or poor quality sleep, overweight, sedentary lifestyle, under too much stress, have increased toxin exposure (noise, pollution, mold, etc.) On the flip side, we make anti-inflammatory choices: take fish or plant oils, exercise, have good sleep hygiene, practice weight control, eat a healthy diet, manage stress in healthy ways, avoid toxins as much as possible. Someone may wonder, how do we know if we have inflammation? The answer is; If you have a chronic disease or chronic symptoms you are inflamed. Going one step further, there are blood tests you can do to check for inflammation. They include: sed rate, C-reactive protein, homocysteine, RA factor, ANA, anti CCP, increased levels of insulin and blood sugar, and c4a. It is important to note, the tests can be negative, and you can still have inflammation. Symptoms are always the “tell.” If quality of life is being affected by your chronic symptoms more investigation is warranted. « Chronic Lyme Disease Fact or Fiction?